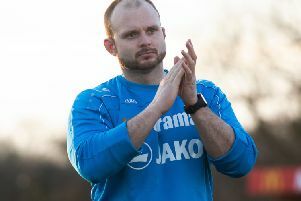 Hemel Town FC have been gazumped by National League outfit Bromley in their attempts to bring former Portsmouth man Ben Chorley to Vauxhall Road. The 6ft 3ins centre-back made 32 appearances for Pompey after joining them from Stevenage in January 2014. He began his career with Arsenal and also had spells at Wimbledon and Tranmere. Tudors manager Dean Brennan admitted he was ‘devastated’ to miss out on Chorley’s acquisition, saying: “We were devastated really because he would have taken us to the next level in that department; he was Portsmouth’s club captain last year. “Everything was agreed and we had sorted everything with his agent, but then Bromley came out of nowhere and offered him a better deal.